Pass the party punch with custom designed kid birthday 10 frosted plastic cups. Your special birthday kid will love seeing their party decor with every sip from this perfect kid-sized party cup. 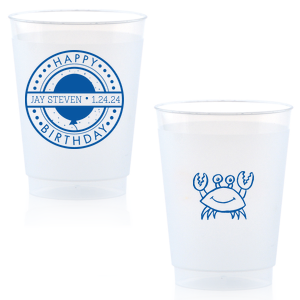 Design your personalized kid birthday 10 oz frost flex cups today! Give the celebration you’re planning an extra splash of personalization with custom designed kid birthday 10 oz frost flex cups. 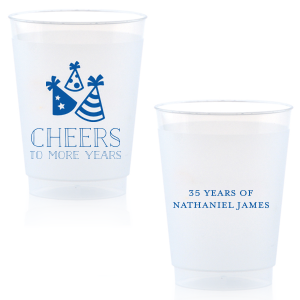 The perfect size for smaller hands, or for mixed drinks for the parents, you can’t go wrong with customized kid birthday 10 oz frosted plastic cups. 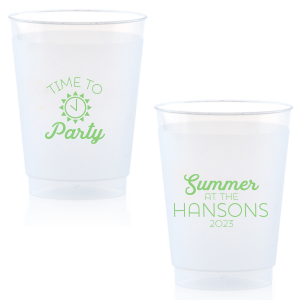 Choose a screen printing color to coordinate your personalized kid birthday 10 oz frost flex cups with your party theme. Choose a design from our design idea galleries and don’t forget that you can customize both sides of your custom kid birthday 10 oz frosted cups. 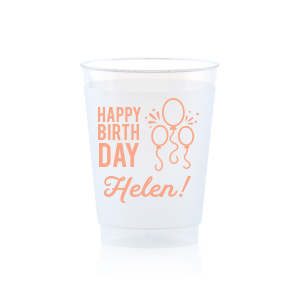 Your birthday girl or boy will love having their name printed on the personalized kid birthday 10 oz frosted plastic cups—order yours today.